The new musical Bel-Ami will receive its world premiere at Charing Cross Theatre on 19th February 2014. The production is a new take on the classic Guy de Maupassant novel by award-winning composer Alex Loveless. Presented by the London College of Music (LCM) it will run 19th February to 1st March 2014. A present-day satire on celebrity, press corruption and politics, the show is set against the fictional backdrop of a US-led invasion of Iran. Its contemporary score includes rap, dance, rock and RnB. Disillusioned former soldier George Dury joins the ranks of his friend’s newspaper, quickly becoming the editor of the celebrity gossip column ‘Bel-Ami’. Manipulating his way into the highest echelons of British society by charming, seducing and blackmailing those who cross his path, he is rewarded with ever-increasing wealth and prestige. But his ultimate goal will always be power. 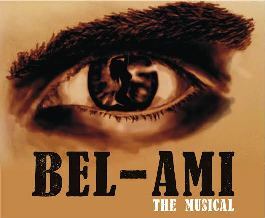 Bel-Ami is the first university production to be staged in the West End. Part of the University of West London, LCM has a long-standing tradition of developing new musicals. The production is directed by Chris Loveless, designed by Laura Clark with choreography by Anthony Whiteman. Orchestration is by Andy Smith and the musical director is George Carter, both alumnus of LCM. Running time: Approximately 2 hours 30 minutes including one interval.